I’m writing a series of blog posts about my volunteer work in cat rescue with Cat Adoption Team (C.A.T.). Part 1 discusses how I got involved and outlines how it works. Part 2 talks about the happy endings that are so rewarding in this work, as well as the sad ones (and also the appallingly infuriating ones) that make some days very hard. There is another kind of outcome to pet adoption, too. Despite good people trying hard, sometimes things just don’t work out. A cat turns out to be a bad fit for a family, or the family’s life changes in tragic ways that make keeping the cat impossible… and they return them to C.A.T.. This is sad for everyone, but it is absolutely the right thing to do in such circumstances. I cannot stress this strongly enough: if family decides not to keep a pet, they should return the animal to us (and any responsible rescue group has this same policy). The most important thing to us is that the cat should always be safe. By rescuing the cat, we made a promise that we will never abandon this animal or allow it to return to the condition from which we rescued it, alone and forsaken in the world. Do not break our promise by abandoning the animal we entrusted to you at the time of adoption. Return it to us. To date, out of the 65-or-so cats I’ve fostered, only one of my own fosters had been returned to us. The family tried hard, but they finally returned him to us. I was sad it had not worked out, but it must be admitted that Airy is a pretty challenging cat. He has also been through a lot. Airy turned up in a feral trap as a starving young kitten on his own, looking for food, a couple of years ago. Before long, it became apparent that something was very wrong with him. It turned out to be an ear polyp, a growth in the middle ear that affects balance, which is why he carried his head at a tilt, was always falling off things, and hated being picked up (it was disorienting). The polyp was also painful (the surgeon described it to me as “like having a low-level migraine all of the time”). It would cause recurrent (and painful) ear infections, and it would eventually cause deafness. The polyp had to be removed, but Airy was too young for the surgery, so he stayed with me for a few months, then had the operation when he was big enough. Here’s a photo of him afterward, with “the ugliest haircut you’ve ever seen,” as the surgeon warned me. 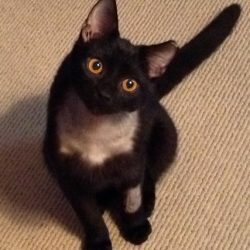 His leg was shaved for the IV, and his neck was shaved because the entry point for the surgery was under his jaw. He recovered well and didn’t have any of the possible side effects (such as nerve damage), but he never lost his head tilt. Since he also has a clipped ear (common practice in Trap-Neuter-Release programs like the one where he entered the system) and an overbite, he’s a slightly odd looking fellow. He also has a very forceful personality, as well as some behavior issues. 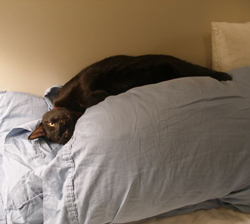 He was returned to me because he had started urinating outside the litter box and around the house soon after moving into his adoptive home, and no matter what accommodations they tried to make, they couldn’t get him to stop. When they decided to give him up, I was very glad they brought him to me rather than abandoning him or passing him on to someone who’d abandon him. They cared about him, but just felt they couldn’t live with him. When Airy came back here, now an adult rather than a kitten, it was a difficult adjustment all around. He was very upset and disoriented (and even now, I’ve no idea whether he remembers having lived here before). Achilles, one of my cats, was appalled by an adult male moving in, and Airy never backs down, so the two of them had violent fights daily. Poe, my pathologically shy cat, hated him (and hates him still), and so Poe had shrieking fits daily for a while, whenever Airy upset him. Airy didn’t even get along with Hector (Achilles’ brother) when he came back—and almost everyone likes Hector. Before long, the stress ensured that I was having the same problem his former family had—he began urinating outside the litter boxes. Finally, though, after about four months, things started settling down. Airy and Achilles stopped fighting and learned to ignore each other most of the time. Airy and Hector became friends. Poe stopped shrieking every day. Airy was using the extra litter boxes I had added to the cat area in the basement. He also stopped being so high strung, anxious, and fussy, and he started to relax, play, and purr more often. Strangely, the turning point for Airy occurred, as far as I can tell, when he established a small cardboard box as his territory. I received a package one day, opened it, and left the box sitting on the kitchen counter for a few minutes. When I came back, Airy was sitting in the box. i figured he’d get tired of it soon, and then I’d recycle it. But, in fact, Airy has never gotten tired of that box. He sits, nests, rests, and sleeps in it. He also seeks it out as his “safe” place when he’s upset, scared, angry, or not sure what to do with himself. The box seems to be Airy’s security blanket, and ever since he chose it as his spot in the house, he has been doing much better here. And once he adjusted and was doing so well here, I realized that adjusting yet again to another home would be very hard on him—even harder if it again didn’t work out (and potentially deadly if the next family wasn’t as conscientious about returning him safely to C.A.T.). And he was trying so hard here, and finally succeeding. So Airy has his happy ending, too. I adopted him in November. 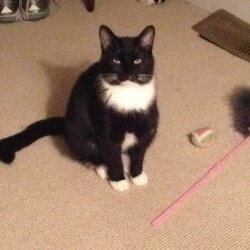 And although we still have our moments of hair-tearing, he is doing well in his furever home. The box, by the way, is so absurdly small, he has to cram himself into it. Yet when I have offered bigger boxes, he’s not interested. This is his box, thankyouverymuch. It’s still sitting on the counter, months after he chose it. 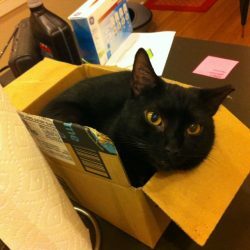 Having a cat-in-the-box on my kitchen counter isn’t ideal… but if this is what it takes to get him to stop fighting, use the litter boxes, and feel secure, it’s a compromise I can live with. Prospective adopters can find our adoption applications and our available cats via C.A.T.’s website or our Facebook page. Also, please check out our How You Can Help page. Obviously, we welcome donations, but there are other ways to contribute, including something as simple as linking your Kroger card to C.A.T. so that Kroger will donate to our rescue every time you buy groceries—at no cost to you! In some future posts I’ll talk about our criteria for rescuing cats and dealing with behavior issues. Since I get a lot of the same questions over time about how I got involved in cat rescue and what it entails, I decided to write a series of blog posts about it. So here we go. To date, I have fostered approximately 65 cats and kittens in my home (which is why my upstairs carpet looks like it belongs in a crack house). 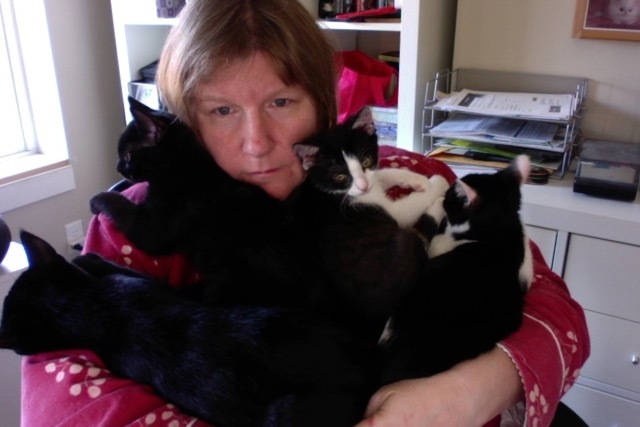 Although I have fostered a few adult cats, I mostly focus on kittens–for several reasons. Kittens are easier to place (that is, more people want to adopt them), and so I can save a greater number of feline lives by fostering kittens; they move through here at a faster rate, making room for more fosters. Also, this is a small house that already has 4 permanent cats, so I favor fostering kittens because, again, they’re more likely to find homes elsewhere, rather than go unadopted and remain here the rest of their lives. 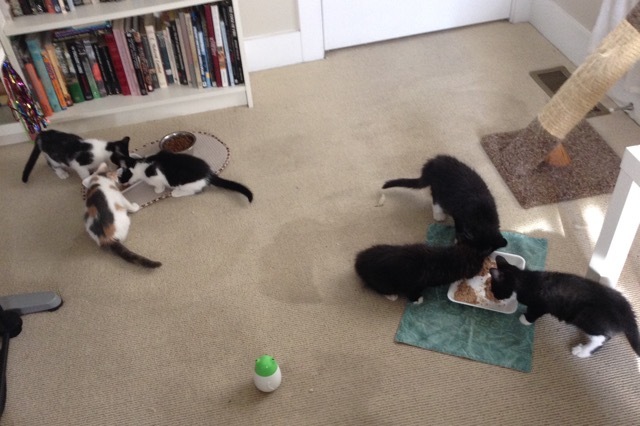 Finally, my adult male cats accept the presence of kittens–they even like kittens and help me socialize them. But two of my cats are very hostile to adult cats moving in here, which creates a lot stress for everyone (including me). Kittens very often arrive without a mother. Sometimes the mother is feral (doesn’t want contact with people, can’t be adopted), so she’s spayed, vaccinated, and released. Often the mother isn’t around; the kittens are at the age where she has stopped caring for them or is about to stop. Sometimes the mother is dead. And sometimes the mom comes into foster care with the kittens (I’ve had two such mom-cats here with their litters; one got adopted, the other is still awaiting adoption). 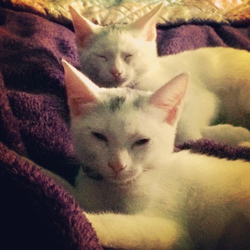 I got into fostering by adopting a couple of cats from a rescue group. 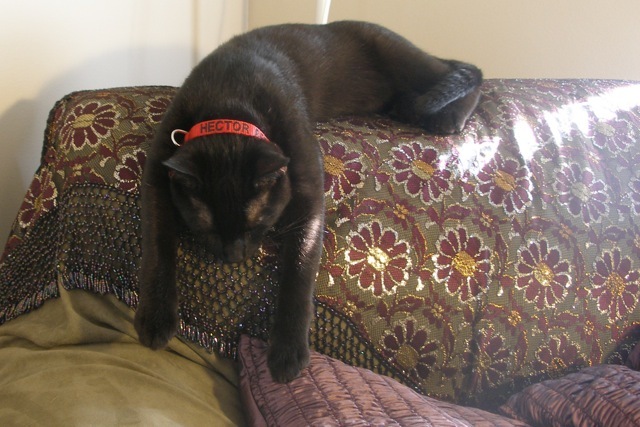 While researching pet adoption (I am a writer; I research everything I do), I read that black cats are hard to place (and therefore have a very high rate of euthanasia), and also that bonded pairs of cats (and dogs) are harder to place than solo animals. I was perfectly willing to adopt both/either kind of cat, and Cat Adoption Team (C.A.T.) 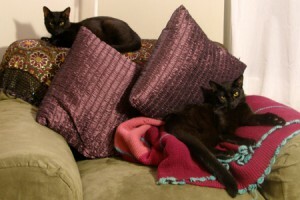 had a bonded pair of black cats available, estimated age 8 months old, probably brothers. I named them Hector & Achilles; I am a Bronze Age geek and a fan of Homer’s Iliad. They were two heroic little fellows who had survived on their own, as far as we know, until they were about 5 months old, when they turned up together at a kill shelter during one of the harshest winters on record here. I adopted them a few months after C.A.T. rescued them. Several years later, they are still inseparable. 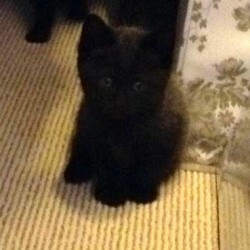 Then, although I had only planned to adopt two cats, I got interested in another cat fostering with C.A.T. 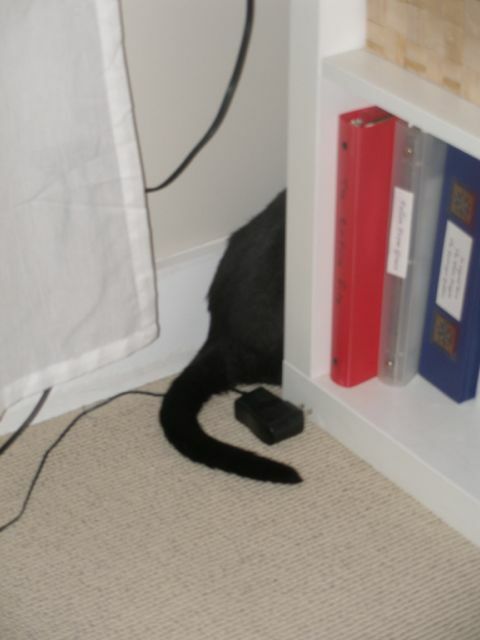 who was so pathologically shy he had little chance of being adopted, Poe. For whatever reason, I felt like this was the right home for him and adopted him, too. It took more than a month for Poe’s foster mom to catch him (though he lived inside her house) so she could transport him here, and it was another month before he would even let me see him. A friend asked during that time how I knew he was still alive, and I said, “Because I haven’t found his body.” Poe now allows me to see him regularly, and I am once in a while even allowed to pet him (briefly); but no one else ever sees him—to the extent that my father refers to him as my “fictional” cat. Well, by the time Poe arrived, I knew some of the people in Cat Adoption Team and was increasingly interested in the work they were doing. I started following their Facebook page, and one day when they needed an immediate foster for two kittens who had turned up at a kill shelter that had no facilities for cats, and time was running out for them, I found myself raising my hand. My two tiny new fosters had multiple infections, which is common in rescue cats, and had to be kept isolated for a few weeks. So I started learning how to medicate and care for young kittens. They both survived and, a couple of months later, they were adopted by a wonderful family that stays in touch and supports our work. And since then… there have been oh-so-many more. Below is a small sampling. With so many kittens passing through, it reduces confusion if we name the litters thematically. In these photos, you see (in descending order): the Donuts (Sprinkles, Powder, Cream, Glaze, etc. ), the Gone With the Winds (Ashley, Scarlet, and Rhett), the Bollywood stars (Rani, Kajol, Rishi, Raj, Shakti, and Dev), and the French Girls (Chanel, Colette, Simone, and Piaf). Our group rescues cats from the street, kill shelters, hoarding situations, and similar circumstances. Many of our cats come through a system of rescuers who have working relationships with foster groups like ours. Although I do sometimes go to a kill shelter to get cats we’re rescuing, most often, my fosters arrive via other rescue organizations we partner with, such as Ohio Alleycat Resources, to get cats who are abandoned and alone in the world to a safe place. C.A.T. is an all-volunteer nonprofit group and a registered 501(3)(c) charity. It covers all the medical expenses and prescriptions for my fosters and provides all the supplies they need (dry food, wet food, litter, over the counter medicines, etc.). I’ve purchased some toys, blankets, litter boxes, food bowls, cat carriers, syringes, etc., but I sometimes get those supplies via C.A.T., too—or via donors. We get our fosters spayed, neutered, vaccinated, and healthy (which takes time, money, and a lot of care in some cases), then post them for adoption. Prospective adopters find our available cats via C.A.T.’s website, our public adoption events, our Facebook page, and our adoption centers. They file an adoption application, their references are checked, and they get interviewed—and, yes, we do turn people down. (Additionally, I told one applicant I turned down that she needed a fish, not a cat.) After the application is approved, they can take home whichever cat(s) they choose or have chosen, and they pay C.A.T. the adoption fee. And when enough cats have been adopted to make room for more, we rescue more. Check out our How You Can Help page. Obviously, we welcome donations, but there are other ways to contribute, including something as simple as linking your Kroger card to C.A.T. so that Kroger will donate to our rescue every time you buy groceries—at no cost to you! Goldzilla, the 8th Esther Diamond novel, will not be released until sometime in 2016. So there is no Esther this (2015) November. I’m sorry! It’s entirely my fault. I’ve fallen way behind schedule. As soon as there is a release date, I’ll post it on this website. I will be doing some updates soon to the Writers Resources Page. If you’re wondering about an item I told you I would add, I have not forgotten! I just haven’t gotten around to it yet. 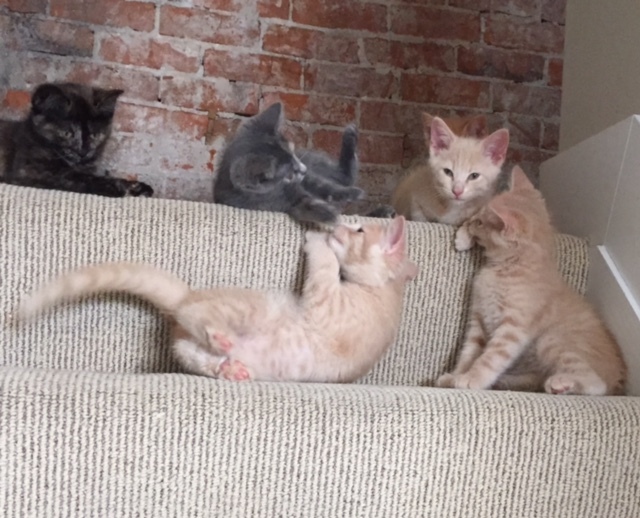 The four foster kittens who arrived here in June (the last time I blogged) all got adopted! I’ve had updates on all of them, and they’re all doing well. 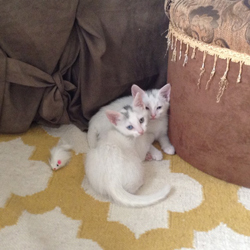 And I have two new foster kittens, Ghost & Frankenstein, who arrived about 2 weeks ago. They’ll be available for adoption as soon as they’re neutered. I’m taking them to the clinic this week to find out whether they’re ready for that. 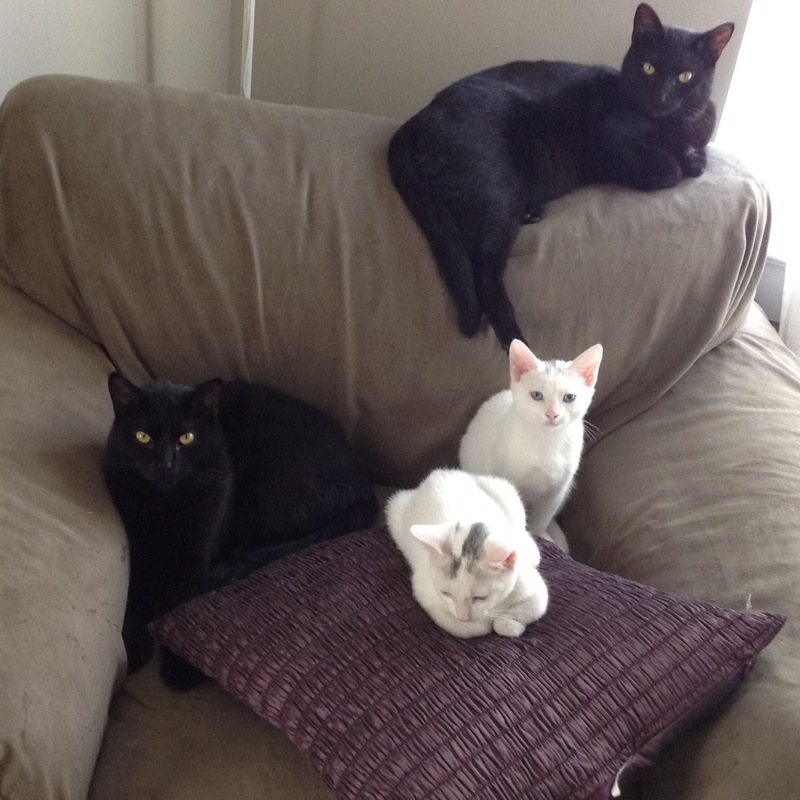 Last year I adopted my 3 cats, Hector, Achilles, & Poe, from the Cat Adoption Team (C.A.T.). Teenagers at the time, the lads have grown up to be very handsome adults, as you can see. I was so impressed with the work C.A.T. was doing, and the good spirits with which they do it, that I started volunteering for the organization. This includes doing a shift or two each month at the adoption center, occasionally doing some errands, and fostering once in a while. These kittens have been living feral, and their mother (recently caught, vaccinated, and spayed) has clearly been taking good care for them. They seem healthy and lively, with good appetites and good temperaments. You can tell they’ve been living wild, since as soon as they hear an unfamiliar noise or feel at all threatened, they all instantly disappear into hiding places–and they’re good at hiding. They’re living in a walk-in closet for now, and I sometimes can’t find them! (I’ll expand their quarters to include my office in a few days, once they’re feeling more secure. For now, they’re more anxious than curious when I open that door, and they prefer remaining in the smaller space.) They were quite afraid of me yesterday, but are starting to relax more around me today. They’re young enough that I think they’ll soon adjust to being handled, and they have outgoing temperaments. There are 3 girls and a boy. The boy has black paws, face, and ears, and then a gray-frosted coat over the rest of his black fur, like a silverback gorilla. He also has only a partial tail. One of his sisters has no tail at all. (This seems to be congenital in both cases; there are no signs of injury.) 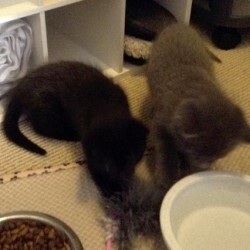 One of the females is a beautiful pewter gray, and the other two are black (one of these is the one with no tail). For whatever reason (maybe it’s the male’s frosted gray overcoat), they look to me like characters out of Chekov or Tolstoy or Pasternak, so I’ve given them all Russian names: Boris, Natasha, Katya, and Sonya. If you’re interested in helping C.A.T. from afar, it’s a nonprofit charity which runs on donations (which are tax deductible), fundraising, and volunteer efforts. So please consider donating to C.A.T. 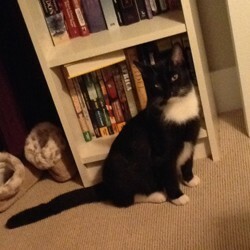 or sponsoring a foster–C.A.T. was able to rescue these four kittens because a kind donor has sponsored them (sponsorship helps C.A.T. cover the medical cost of fostering; these kittens are currently taking meds for worms and diarrhea, and they will all be blood-tested, vaccinated, and spayed/neutered before being eligible for adoption). If you’d like to follow C.A.T.’s activities, they’ve got an active Facebook page. And if you’re local to the Cincinnati area, they can always use more fosters and volunteers, if you’re interested–as well as “furever” families for their rescues, if you’re thinking of adopting! No, Snap is not a feline, but he falls within a general TGIF-and-animals theme, so here goes. This piece first appeared a year ago, in March 2014, in my monthly Nink column for Novelists, Inc., when Snap, my first foster puppy, was living here. Snap, 4 months old, on his first day here. Since I work at home and since this house has a (small) fenced yard, I recently decided to try something I’d been thinking about for a while—fostering a service puppy. 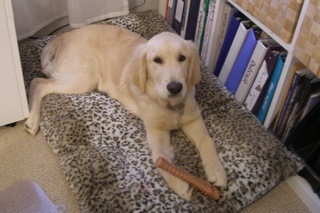 Snap is a golden retriever who moved in with me in the autumn, when he was four months old. 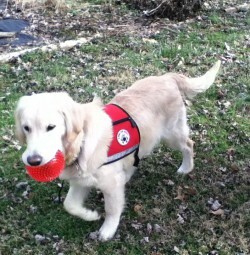 He’ll return to the foundation that owns him, 4 Paws For Ability, sometime this spring, when he’s ready to start his adult training to become a service dog for a disabled child. (The specific type of work he’ll do will be determined when he’s evaluated at the start of his skills training.) If all goes as expected, he will graduate from the program after intensive training, be successfully paired with his permanent family, and spend the rest of his life as some lucky kid’s best friend and working partner. The goal for Snap, while he lives with me, is for him to become a confident, courteous companion in the world where he’ll eventually accompany his permanent human partner 24/7. Therefore, in addition to learning to be a good house dog and attending obedience classes, Snap goes virtually everywhere with me: post office, library, supermarket, retail stores, the bank, coffee shops, my mechanic’s garage, waiting rooms, public lectures, and so on. Snap at 6 months, invited to a friend’s holiday brunch with me. This month, he’ll attend a local sf/f convention (Millennicon) with me, where he’ll be at my side the whole time I’m doing all the usual stuff I do at conferences. And I fervently hope that while I’m speaking to audiences, Snap won’t suddenly start gagging, hiccuping, or vomiting—all of which things he, like many puppies, tends to do when you least expect it. When he’s invited (which is often), Snap also accompanies me to parties and dinners at my friends’ homes. (Actually, invitations these days tend to read, “We haven’t seen Snap in too long! … Oh, and of course, you’re welcome to come here with him.”) There’s also a checklist in my foster handbook of things I am asked to expose Snap to, so they’ll be familiar to him as an adult, such as: elevators, sliding doors, cars, public transportation, the zoo, museums, live music, etc. So, obviously, there’s a lot I’m supposed to teach Snap in the months that he’s here. But I had not realized until after his arrival that Snap would also teach me a great deal. For example, the standard best case scenario in my working life is that I write a book, the editor tells me it’s okay (or tells me a few things need to be fixed; or says nothing at all to me), the book then goes into production, and I start writing the next book. Apart from that, in my experience, writing is mostly a life of being rejected and reviled. So I was skeptical about 4 Paws’ strict insistence on positive reinforcement training, wherein I reward Snap’s good behavior with praise and dog treats, and I ignore his unsatisfactory behavior (or, if it’s problematic behavior, like dirtying the carpet or eating a chair, I tell him “no” and show him the right thing to do—such as go outside or chew on a bone). This made no sense to me. It would never work! Surely, I thought, when Snap wants to chase his squeaky-toy instead of doing his obedience drills, I should tell him that there are a thousand puppies lined up at his back, eager to take his place if he doesn’t do what I tell him to do—and those puppies will gladly train for half the treats he’s getting! That’s how I was taught to be a working writer, after all. Shouldn’t a working dog also be inspired by similar motivators? But I was wrong. To my astonishment, this whole “praise and rewards” system is effective. As soon as Snap realizes he’ll get a bacon-flavored goody for sitting when I say “sit,” he’s eager to comply. When he’s off-leash at my local park, he makes a game of running 30 yards ahead of me, then waiting for me to say, “Come,” so he can get showered with praise when he returns to me. Around the house, he increasingly repeats behavior I tell him is good (such as playing with his own toys, lying on his bed, and staying out of my way when I’m cooking) and seldom repeats behavior that goes unrewarded (such as stealing used tissues from the waste bin, which I refuse to play with or let him shred). Imagine if editors praised us for writing a good story, delivering a clean manuscript, and conducting ourselves professionally. And now imagine if they did it every time we wrote, delivered, and conducted! Wow. What a wonderful world it would be. On the other hand, Snap has also taught me that good looks matter more than I want to admit. Snap is a beautiful dog—and this attracts people to him. I know, because everywhere I go, people comment on how beautiful he is—then ask if they can pet him, what his name is, how old he is, etc., etc. Snap has a service vest he wears whenever we leave the house, which outfit enables him to accompany me everywhere, since there are very few places that service dogs aren’t allowed. The vest engenders a lot (a lot) of conversation with total strangers wherever we go. This amuses all my friends, since—brace yourself for a shock—I am not a people person, and I now typically find myself, as ambassador for my 4 Paws foster puppy, obliged to engage in friendly chat with strangers a dozen times a day. I’d honestly rather be subjected to a Vulcan mind probe, but whaddya gonna do? Snap at 10 months, looking so grown up. So, yeah, the reality is that looks make a difference. There’s a good reason that so many protagonists in commercial fiction are good-looking, and we shouldn’t feel we’re pandering or “selling out” when we write characters with enviable looks. People are attracted to another being’s beauty. I currently encounter empirical evidence of that every single day. Nonetheless, Snap has also taught me that, while beauty may attract, character and personality are genuinely where it’s at. I have friends who get choked up at the thought of Snap leaving our lives this spring when he moves on to his next phase—not because he’s physically beautiful, but because Snap has a beautiful soul. And for all that total strangers are attracted by his beauty, it’s Snap’s sunny, gentle personality that makes busy people halt their day to spend five minutes petting a stranger’s dog at the supermarket or computer store. Like any good protagonist, Snap is someone you start caring about within moments of meeting him. 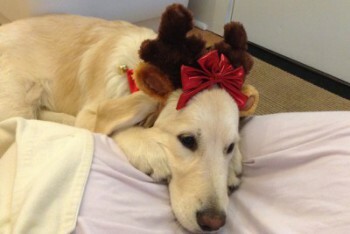 Snap begging me not to make him wear his Xmas costume in public. Well, yes, and yes. But so what? This story isn’t about me; it’s Snap tale. It’s also about the disabled child whose life Snap will enrich and enliven–and quite possibly save, as these dogs often do. I’m not a humble person, but it strikes me as self-evident that, in this narrative, Snap and his eventual partner are the spine of the story, and I’m just a secondary character who’ll feel bereft for a while after Snap returns to 4 Paws for his adult training. Meanwhile, I’m teaching him how to live in the world—a skill we’re all a little shaky on, including me, yet we nonetheless manage to muddle through. Missing someone we love and who is no longer around is one of the things we all have to learn to do—and, after all, I think Snap will miss me, too. This puppy has a challenging, rewarding, and important life ahead of him, and that’s what I focus on when I think about saying goodbye to him. I also keep in mind that after he moves on, I will no longer be goosed out of a sound sleep or interrupted mid-paragraph by Snap vomiting on me. If you’d like to read more about 4 Paws For Ability, I first learned about them via this interesting article. If you’d like more information about fostering for them (they’re in Xenia, Ohio, and fosters need to live within 2-3 hours of there by car), you can find it here, including information about their university fostering program (students foster for a semester). Also worth reading even if you live in another region but would like to learn more about fostering service puppies, in general. You can also follow 4 Paws on Twitter or Facebook. Feline Friday: The Infamous Hector! Not long after I adopted Hector last spring, he dismantled a screen on the second floor one night–and fell out, plummeting 20 feet. I had been brushing my teeth in the bathroom, a few feet away from that window, and when I heard him climbing the screen, I thought, “That seems dangerous. 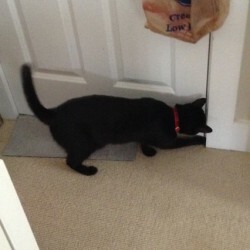 I’ll go make him stop.” I went out into the hall to do so–and so I was within 2 feet of Hector when this happened and saw my new kitten clinging to the window screen as it buckled, peeled away from the window with a metallic moan, and fell. I live in a renovated old Victorian that dates back to (probably) the 1880s, and it’s a LONG way down to the ground from my second floor. In my nightgown, my mouth foaming with toothpaste, I screamed, dropped my toothbrush on the carpet, and went flying down my steep, narrow steps to the first floor and out into the night, expecting to find feline pancake on the sidewalk outside the side door. Instead, I found the wrecked screen (BIG, since my lovely windows are about 6 feet tall), but no Hector. Had my eyes deceived me? Had he somehow saved himself from falling? Was he clinging to the window frame upstairs? Leaving the door wide open, I ran back upstairs and searched the area. No sign of Hector. I ran back downstairs and outside. Still no sign of Hector. I went inside and ran through the house, looking out the back and front door. In my panic, I left these open, too–so now all three doors to my house were standing wide open at 1:00 am. (I live on an urban street with not-infrequent crime problems, and my house had been burgled only a few weeks earlier, so this wasn’t a harmless mistake.) I ran upstairs again, wondering again if I’d hallucinated seeing Hector fall to his death. I ran downstairs and outside again, still foaming toothpaste at the mouth, running around in my nighties. 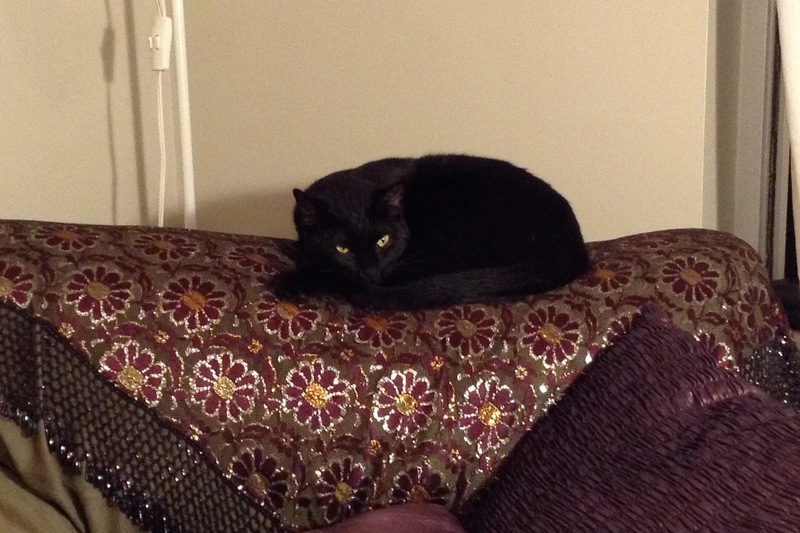 I finally heard him meow from the backyard, so I went back there to search for… a small black cat hiding in the dark. This took some time. And this, it soon turned out, was to be typical of life with Hector, rather than a one-off incident. I swear that cat will give me a heart attack one of these days. 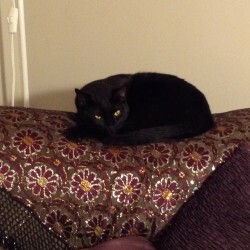 Hector plots his next cunningly evil plan. In subsequent months, I would find Hector inside the washing machine–about 90 seconds after I started the wash cycle; sitting outside, waiting to come in (since I live in the city, my cats are not allowed out); in a tree (repeat: not allowed out); dangling by his head from a coat hanger in my closet; falling into a freshly-used toilet in the dark only a nanosecond after I had vacated the seat; tipping over large pieces of furniture on himself; attempting to escape via the duct system; stuck in an inaccessible crevice within the kitchen island; dismantling a screen on the ground floor and escaping outside yet again (not allowed out); and chewing through electrical wires while they were plugged in. Despite all that, I am very attached to Hector and will be grief-stricken if he drives himself into an early grave (as seems to be his intention). He’s extremely friendly, affectionate, social, bold, playful, and fun to have around (when not trying to give me a heart attack). His persistence can be annoying when he wants attention while I’m trying to work (or sleep, or eat, or take a bath), but he’s easy to care for on a day-to-day basis, since he has an excellent appetite, isn’t at all fussy, and can amuse himself for long stretches by playing with his toys. 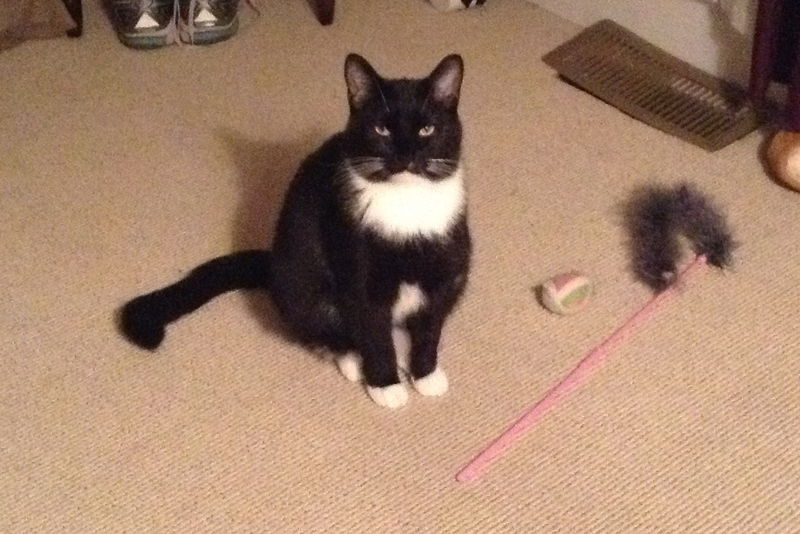 He particularly likes toy mice stuffed with catnip, and he really likes to play fetch with them, like a dog. He and his brother, Achilles, survived for several months on their own before turning up at a rural kill shelter during the unusually harsh winter of 2013-2014, and it’s clear from the way he plays with his toys (and attacks insects that get into the house) that Hector was a good hunter–and could survive as a feral cat again, if he had to. Hector is convinced that if he waits long enough, something interesting will happen in the 4-inch gap between the bookcase and the wall in my office. I also think Hector probably fed Achilles (who isn’t as good a hunter) sometimes when they were living rough. Certainly the two of them are very attached to each other, and they share almost everything–though Hector is very bold and greedy about food and toys, and Achilles tends to let him have his way (as I do, too, when I’m tired enough–did I mention how persistent he can be?). The upside of Hector’s too-rambunctious temperament is that almost nothing bothers him. He finds everything interesting, rather than scary or threatening. While this leads him into danger, it also means that he adjusts almost immediately when I bring home a foster puppy (as I did in August) or foster kittens (as I did in September) or another permanent cat to live with us (as I did also in August). Which means I know that any future animals I bring into the house will have at least one fast friend–the infamous Hector! 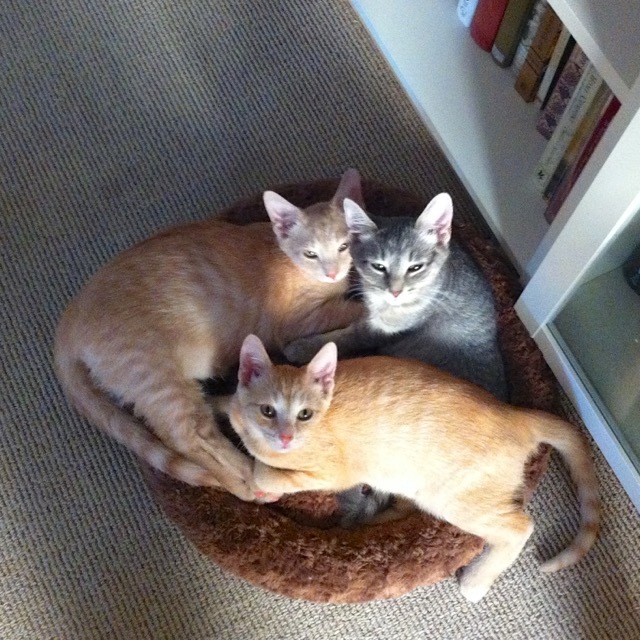 I adopted Hector, Achilles, and Poe from the Cat Adoption Team (C.A.T. ), a local rescue group for which I have since started fostering and volunteering. They do great work, so if you live in the Ohio-Kentucky-Indiana tristate area and are interested in adopting (or fostering or volunteering), please visit their website or Facebook page. If you live elsewhere, you can still help C.A.T. by donating or sponsoring; all gifts to them are tax deductible. See their website for details. For the complete rundown of the animals who’ve lived here Nov 2013 through Feb 2015, see this post. Comments Off on Feline Friday: The Infamous Hector! A friend reminded me recently that I used to say that when I finally bought a home and settled down (I used to live a peripatetic existence), I would start filling my house with animals. 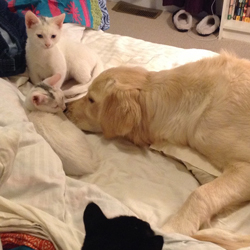 Well, I bought a home just over 2 years ago–and, lo, I have filled it with animals! In May, I adopted two cats from the Cat Adoption Team (CAT), a small local volunteer group which rescues cats and kittens from kill shelters and from the streets, and then fosters them (including providing all necessary medical care, spaying/neutering them, and getting them microchipped) until they’re adopted. (For those who are interested, CAT is a registered 501(c)(3) charity which accepts tax deductible donations. They also always need fosters, volunteers, sponsors, and, of course, people interested in adopting a cat and giving it a permanent, safe, loving home.) You can follow them on Facebook or Twitter, or visit their website. So I adopted two black cats from CAT in May 2014. We assume they’re brothers. They had turned up together at a rural kill shelter months earlier, after surviving for a few months on their own during an unusually bitter winter here. They seemed like heroic little fellows to me, so I named them after two of the most immortal heroes of all time, Hector and Achilles from Homer’s Iliad. In the story, of course, Achilles kills Hector in combat; but in this household, Hector & Achilles are inseparably close, the best of pals, and do everything together. They’re also very friendly and social, as well as very food-motivated, so it’s a lot like having two tiny labradors in the house, but with less mud or drool. Hector & Achilles, occupying my writing chair. Right around the time I adopted them, I got very interested in a hard-luck case at CAT. Rescued from the streets as a youngster, he was an extremely shy black-and-white tuxedo cat named Poe (a name I kept, since it suits him perfectly). 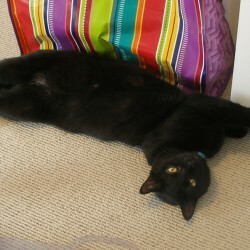 Because Poe was too fearful to come to adoption events and too feral even to be visited in his foster home (where he mostly lived in hiding), there seemed little hope of his being adopted. 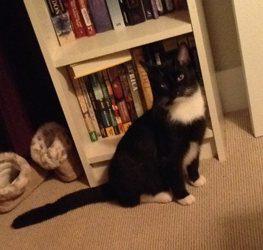 But I somehow felt that this super-shy fellow, named after a writer, belonged here, along with my two well-adjusted, gregarious young cats (Poe is terrified of people but very cat-oriented, so he needed an adoptive home with cats who would befriend him). It took his foster a while to catch him and get him into a carrier, but eventually, 2-3 months after I adopted the brothers, Poe moved in here and I adopted him, too. Since then his progress has been slow, and I think he’ll always be a shy, anxious cat who hides from most people, but he has been making strides and settling in well. He’s great pals with Hector & Achilles, he now hides under the bed only part of the day, and he plays with his toys and enjoys his meals. As you can see, he is also quite a handsome fellow. Well, by then, I was really interested in CAT and the work they were doing. This small, well-run group with a tight budget is placing over 200 cats per year in adoptive homes–which is a lot of feline lives for a few volunteers to save. They also vet adopters carefully to make sure the cats they’ve rescued really are going to safe, loving, permanent homes. 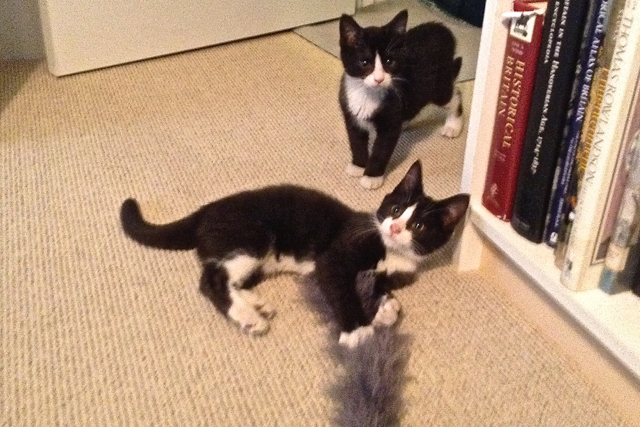 So when a couple of tiny kittens turned up in a rural kill shelter which had little ability to care for them, at a time when CAT volunteer homes were full-up with recent fosters, I decided to foster these two for CAT. Although a bit of work at times, since the kittens were sick when they arrived and didn’t recover fully for about 6 weeks, it was a great experience–including the support I got from CAT, which provides the food, toys, medicine, and medical care, as well as plenty of constructive advice and moral support. 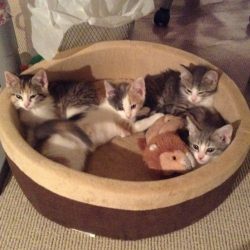 The kittens were little charmers who fit in well here, and who were adopted by a wonderful family soon after getting fully healthy and being spayed. Saying goodbye was hard, but it’s great to see cats who were abandoned and destined for an early death instead go home with a loving family one fine day. My foster kittens on their first day here. Now growing up in their forever home. MEANWHILE…. a little over a year ago, before I ever brought any cats into the house, I started fostering puppies for a service dog organization, 4 Paws For Ability, which focuses primarily on providing service dogs to children with a variety of disabilities, including epilepsy, diabetes (seizures), hearing impairments, autism, fetal alcohol syndrome, mobility issues, and more. Fostering a service puppy is a big commitment, and (people always ask this, so let’s cut to the case), yes, giving them up is hard. But it’s worth it when you see your puppy graduate from training as a confident, skilled adult dog, and you meet the child and family whose lives this dog is completely changing. 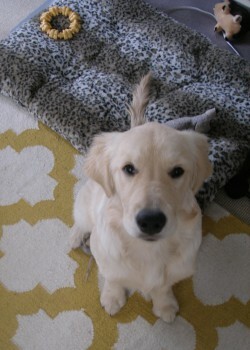 My first foster was Snap, a male golden retriever puppy who lived here for about six months. About a week before I adopted Hector & Achilles, Snap returned to 4 Paws for his adult training. Snap was trained as a seizure alert dog, and he partners a little girl in Florida. He did very well in his training and, at last report, is doing great with his family, who love him and value the independence and security he brings to their daughter’s life. During the months after Snap left, I adopted Hector, Achilles, & Poe. 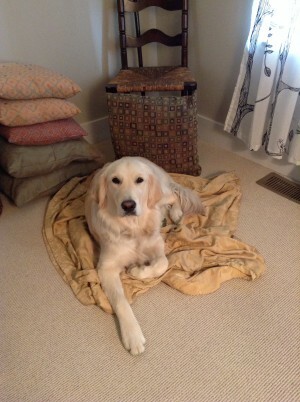 Then I fostered my second service puppy, Riona, a female golden retriever–and Snap’s younger half-sister. Riona at about 5 months. Riona recently also went back to 4 Paws. She’s currently doing some additional training, and I’ll check on her in a couple of weeks. At present, it sounds like she will go into the breeding program rather than into service. Dogs in the breeding program live as family pets, and they have 2-3 litters to provide 4 Paws with more service puppies, before being sprayed and living out the rest of their lives with their families. In fact, although Riona is a very gentle dog who loved training and was good with kids, I think this is a good choice for her future, since Riona will make an excellent mother. 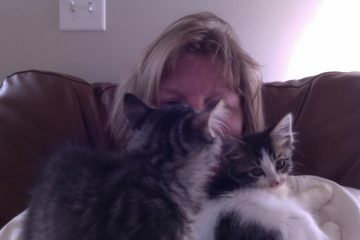 While she was living here, my foster kittens moved in with us for two months–and Riona adored them. 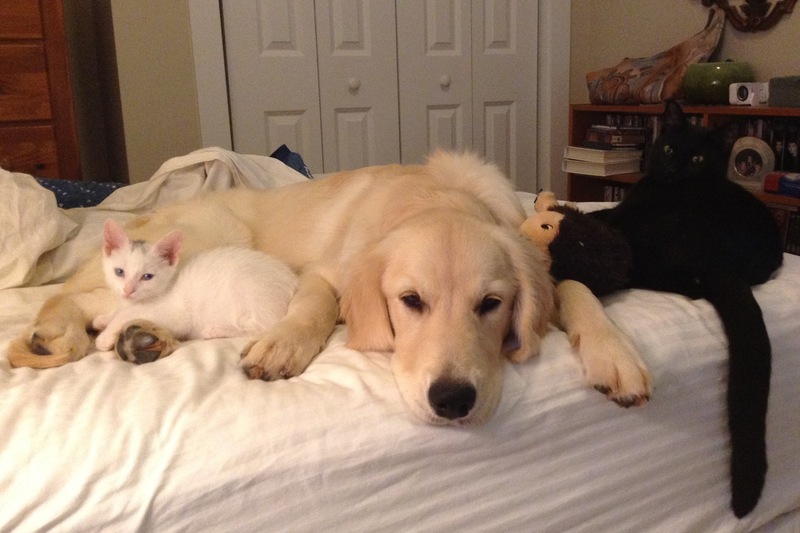 She played with them, napped with them, hung out with them. Although she was more than 10 times their size, she was a terrific playmate for them, gentle and patient. She also came along to adoption events with us and did a great job of comforting and calming them, since being in a carrier in a public place surrounded by strangers is scary for kittens. Riona hanging out with the kittens. With the kittens adopted and Riona back at 4 Paws now, there are currently just three 4-legged beings in residence here–the permanent ones: Hector, Achilles, & Poe. But for a while there, I had 6 animals in my small 2-bedroom townhouse, all of them very young and active (the eldest, Poe, is estimated to be only about 18 months old as of this writing), and 3 of them sick and requiring medications, extra cleaning (vomit, diarrhea, and bladder problems), and extra care. 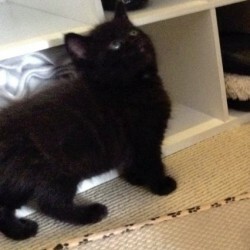 (The kittens arrived with multiple infections, and Riona got very sick as a puppy and needed medication for a couple of months.) And, as a neighbor pointed out when discovering me in a frazzled, babbling state outside my home one day, I had gone from 0 to 6 pretty quickly, without much time to adjust. Copyright © 2019. Laura Resnick. All Rights Reserved.